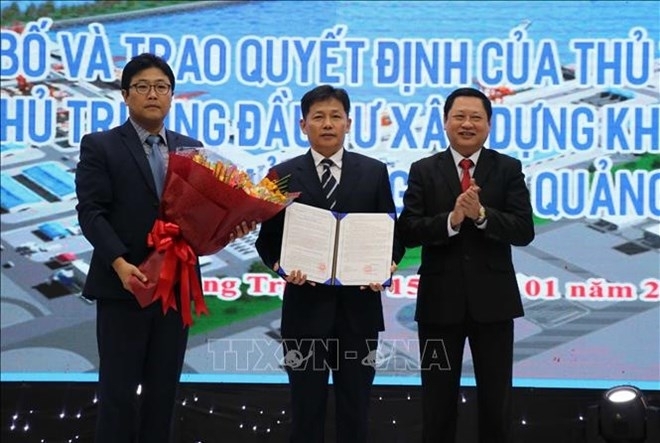 The central province of Quang Tri’s People’s Committee held a ceremony on January 15 to announce and hand over the Prime Minister’s decision that approves the construction of My Thuy port. Earlier on January 4, Deputy Prime Minister Trinh Dinh Dung signed Decision No.16/QD-TTg approving the project in Dong Nam economic zone in Hai An commune, Hai Lang district. Accordingly, the project will cost over 14 trillion VND (608 million USD), over 2 trillion VND of which will come from the investor My Thuy International Port Joint Venture Company and the remaining from other sources. The 685ha port will be home to 10 wharves capable of receiving vessels up to 100,000 tonnes. During the first stage from 2018-2025, four wharves will be built with an investment of nearly 5 trillion VND. There will be another three to be constructed at the same cost during the second stage from 2026-2031, and the remaining three worth more than 4.3 trillion VND in the third stage from 2032-2036. The port will mainly serve the Dong Nam economic zone, industrial zones in Quang Tri, and cargo in transit from Laos and the northeast region of Thailand on the East-West economic corridor. 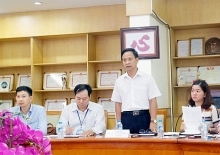 Speaking at the ceremony, Chairman of the provincial People’s Committee Nguyen Duc Chinh asked the investor to work with partners to arrange capital and launch the project this September. He vowed all possible support to them to complete the project on schedule.